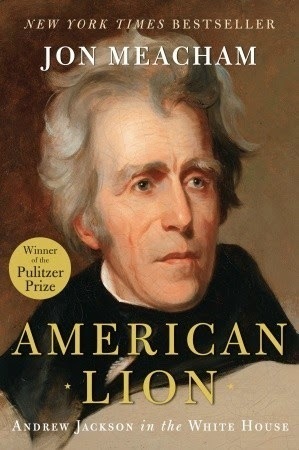 Book Jacket: "Andrew Jackson, his intimate circle of friends, and his tumultuous times are at the heart of this remarkable book about the man who rose from nothing to create the modern presidency. Beloved and hated, venerated and reviled, Andrew Jackson was an orphan who fought his way to the pinnacle of power, bending the nation to his will in the cause of democracy. Jackson’s election in 1828 ushered in a new and lasting era in which the people, not distant elites, were the guiding force in American politics. Democracy made its stand in the Jackson years, and he gave voice to the hopes and the fears of a restless, changing nation facing challenging times at home and threats abroad. To tell the saga of Jackson’s presidency, acclaimed author Jon Meacham goes inside the Jackson White House. Drawing on newly discovered family letters and papers, he details the human drama–the family, the women, and the inner circle of advisers–that shaped Jackson’s private world through years of storm and victory. Jon Meacham in American Lion has delivered the definitive human portrait of a pivotal president who forever changed the American presidency–and America itself." Taryn's Review: The period of history that I study is predominantly known as "Jacksonian America." The dates aren't very well agreed upon, so I'll throw out 1815-1846 (in line with historian Charles Sellers). While I knew the major events that shaped Jackson's presidency, I really was unfamiliar with the details. Jon Meacham's book focused mainly on the years of Jackson's presidency (1829-1837). The book was filled with sources that can easily come off dryly, but Meacham's style of writing made the story enthralling. I especially enjoyed Meacham's inclusion of Jackson's relationship with his nephew Andrew Jackson Donelson and Donelson's wife, Emily Tennessee Donelson. The two lived in the White House with Jackson and raised their kids in Washington during most of Jackson's presidency. Often times it's easy to think of Jackson sitting alone at the White House, but Meacham showed how Jackson surrounded himself with family and close friends, especially since Jackson lost his wife Rachel in December 1828 before leaving for Washington. Jackson could have a fiery temper, but he could also fierecly love. Meacham really brought Jackson's story to life and how Jackson interacted with those he loved and those he abhorred. I think inclusion of the circle of people around Jackson and their influence upon him was really interesting and Meacham made a really easy visual out of sources that can be piece-y to put together. There is no question that history lovers of the period will enjoy this book (and if you are a history lover, check out his acknowledgement section, which is basically filled with really cool people in history that he got to meet!). Overall Jackson was an interesting character, but Meacham really made me feel as if I were standing in the room with Jackson and the Kitchen Cabinet as they made big decisions. A great read (and also a Pulitzer Prize winner! ), so don't be afraid to give this one a try if you enjoy history. It's a fascinating glimpse into the making of America as we know it today.